240 pages | 38 B/W Illus. The relationship between religion and the state has entered a new phase ever since the Iranian Revolution more than three decades ago. The recent mass uprisings against autocratic rulers in the Arab world have highlighted the potency of Islamist forces in post-revolutionary societies in the region, a force arguably unlocked first by Iran’s version of the ‘spring’ three decades ago. The economic ramifications of these uprisings are of special interest at a time when the possibility of the creation of Islamic states can have implications for their economic policy and performance again. A study of the Iranian experience in itself can offer rare insights whether for its own features and characteristics or for its possible lessons and implications for recent events in the region. This book is concerned with the economic aspects and consequences of the Iranian Revolution in general and its interaction with the international economy in particular. Many studies have to date dealt with Iran’s economic challenges, policies and performance in the post-revolutionary period but its interaction with the international economy – although of growing importance – has not received sufficient attention. 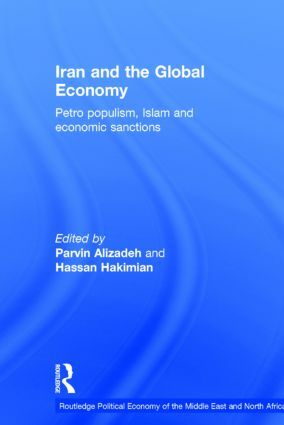 The contributions in this volume by experts in the field address ways in which in the span of three decades, Iran’s economy has evolved from a strong aspiration to develop an ‘independent economy’ to grappling with debilitating international economic sanctions. Parvin Alizadeh is a lecturer of Economics and a coordinator of studies at Boston University’s study abroad program in London. She held the position of a Principal Lecturer in Economics at London Metropolitan University during 1990-2011. Hassan Hakimian is a Reader in Economics and Director of the London Middle East Institute at the School of Oriental and African Studies, University of London, UK.